SILVER SPRING, MD / ACCESSWIRE / March 21, 2019 / In honor of World Water Day on March 22, Hostelling International USA (HI USA), a national nonprofit with more than 50 hostels nationwide, has announced "The Million Gallon Challenge," enlisting guests to help them save a million gallons of water over the next year. HI USA was awarded a $250,000 grant by Booking.com to install Hydrao SmartShowers in all its owned and/or operated hostels. 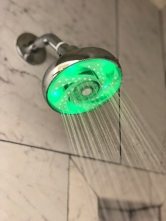 The new SmartShower is the first of its kind and uses colored lights to provide visual cues on shower duration. HI USA is asking all guests to cut thirty seconds off their showers.